Guest speaker Ron Wroblewski addresses the assembled in Gallipolis City Park after the National Vietnam Veterans Recognition Day Welcome Home Parade. GALLIPOLIS — Area residents and veterans gathered along Second Avenue for a Welcome Home Parade, and later in Gallipolis City Park on Friday, for a memorial ceremony in honor of National Vietnam Veterans Recognition Day. Visitors were welcomed by VFW Post 4464 Honor Guard Commander Bill Mangus. Commander of the American Legion Lafayette Post Charlie Huber led the crowd in a rendition of “God Bless America.” Rev. John Jackson gave the invocation. Banners were presented by the honor guard and the Pledge of Allegiance was given in unison among the assembled. Ron Wroblewski was born in Charleston, W.Va, graduated from Gallia Academy High School and is a Vietnam combat veteran having served as a field radio operator with the United States Marine Corps from mid 1963 to late 1966 (Vietnam 1965-1966). He served as the day’s keynote speaker. He has previously said his service connected disability hasn’t diminished his love for America or his desire to continue to give back to his country. 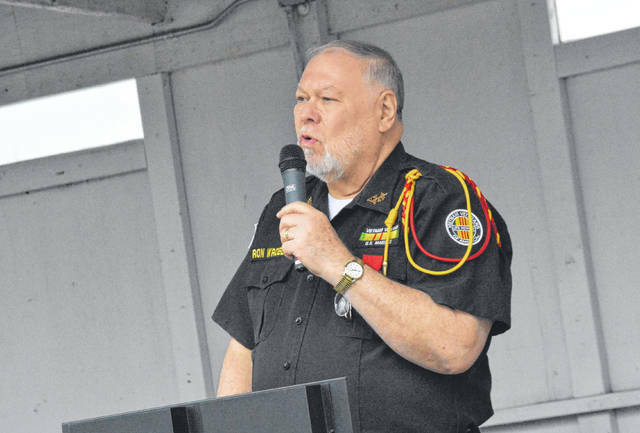 He has served as the President of Tri-State Chapter 949, Vietnam Veterans of America and the West Virginia Marine Corps Coordinating Council. VVA members say his accomplishments are many. He has been named a Hometown Hero. Some may say his most significant and most recent successful project was getting a U.S. Naval ship named in honor of Hershel “Woody” Williams, West Virginia’s only living Medal of Honor recipient. VVA members say it took 18 years of dedication to get the Navy to name the ship. City Commissioner Stephen Wallis read a proclamation along with Gallia County Commissioner Brent Saunders recognizing the day as National Vietnam Veterans Recognition Day. Larry Marr, local chapter president of the VVA, read a list of area Vietnam veterans who had died in remembrance. Executive Director John Thomas of the Gallia Veterans Service Office also read a proclamation recognizing the day. Taps was played by Honor Guard member John Watson and Chaplain Michael Giese gave the closing prayer.